You may have heard about one person planting a certain food plot that the deer didn’t touch, but 3 miles down the road someone else planted the same food plot blend with drastically different results. Were those deer in the heavily used plot any different than the un-used plot? Have they been trained to eat that plant when the deer in the other neighborhood have no such experience? The answer lies in the individual preference for certain nutrients. One plant might have been planted on slightly better ground. The bad plot may not have had the right pH or was missing some nitrogen. There are too many variables to consider to always know why some deer didn’t eat what they were supposed to. Another often overlooked variable is that every deer has its own taste preference and at a broader level, some herds have their own taste preference. The only way to know what deer love the most in your area is to experiment. Here are some tendencies I’ve noticed in my years of talking with customers about what deer like and don’t like. 1. If you have access to free feed (in a gravity or trough feeder), the consumption of blocks goes down. Deer are lazy and when they have something readily available right next to something they have to work at to extract nutrients, they will pick the easy way 9 times out of 10. I’m not saying you shouldn’t put a block next to a feed site (that is a great way to help subordinate deer eat), I’m just saying you shouldn’t expect to see that block disappear as quickly as if it were the only feed option in that area. 2. Just because a certain flavor doesn’t exist in your area, doesn’t mean that deer won’t eat it. I know plenty of guys that have great success with our liquid Persimmon Braggin Rights, even though there isn’t a persimmon tree for hundreds of miles. The same holds true for the granular Braggin Rights. Deer in one area might hammer Acorn while deer in another area might prefer the Chestnut, even if chestnut trees haven’t been on the landscape for a century. Best way to find which one they like is to pour all three in front of one camera and see which ones the deer eat first. 3. If deer do not like one thing, try another to switch things up. If you tried one of the liquid attractants, try using granular. 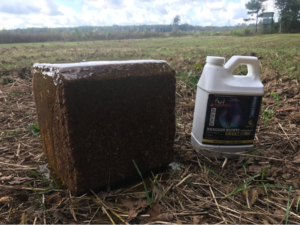 If you didn’t have much luck getting the deer to eat a block, try opting for an easily accessible complete feed like Ani-Supplement GOLD. If you still are having trouble, try using a combination of products to get your deer excited. My favorite summer combo is the Ultimate Mineral Site where you mix a bag of granular Mineral Dirt 180 into the ground, place an Ani-Mineral Block on top of it, and then top it off with a bottle of liquid Mineral Dirt 180. Using all three together makes for a killer combo! If it is early fall, I like pouring a gallon of liquid Sweet Corn over our Ani-Protein Block 365. You can even pour a bag of granular Braggin Rights on top of the liquid and it will stick to the block. 4. Deer do not like to ingest sand. If you live in an area that has sandy soil, try keeping your mineral sites away from the sand. You can accomplish this by pouring our liquid Mineral Dirt 180 on an old, decomposing stump, then pour granular Mineral Dirt 180 on the liquid. If you choose the right stump, you will see deer eating the fibrous stump material and not eating the sand beneath it. 5. 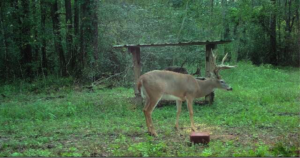 If deer have no experience using a feeder, it will take some time for them to get used to it, especially if they are mature bucks. Please revisit my blog about the subject of feeder fright. The younger a deer is when they use a feeder for the first time, the more willing they are to use one later in life. 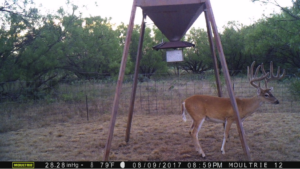 We have no problems getting mature bucks to use feeders in Texas and that is because they grew up around feeders. Sign up for our newsletter to get more of this great content delivered straight to your inbox! Great read! Lots of unknown and useful information!